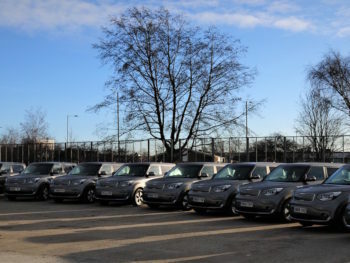 Falkirk Council has deployed 10 more Kia Soul EVs, taking its electric vehicle fleet to 45 vehicles in total. The new vehicles, which are funded on contract hire by Daimler Fleet Management and join the council’s 600-strong fleet, are being supported by the addition of 26 charging points to the council’s infrastructure. In total, Falkirk Council has 50 charge points at its disposal and also has wider plans for both public and council-only charge points, including a project at Falkirk Stadium which will see around 30 new canopied photo voltaic charging points installed. The fleet procurement was tendered under mini-competition, with the tender process managed by Link Asset Services, the council’s Treasury advisors. Pat Taggart, fleet manager, Falkirk Council, commented: “We have had Kia Soul EVs as part of our fleet since February 2017. Using them as part of a mixed fleet, among Citroën C-Zeros, Toyota Prius and Nissan eNV200s, we’ve been really impressed with how they have performed. We’ll certainly be adding further EVs in 2019. Judith Eadie, senior funding advisor at Link Asset Services, added: “Falkirk Council is a shining light as to how a large fleet of more than 600 vehicles can seamlessly incorporate a growing proportion of electrics. While the majority of the fleet is diesel, the electric vehicles play a fundamental and valuable role.